Youth organization ‘PAHAL’ organized a Blood Donation Camp in collaboration with Eye Donation Association Jalandhar and Reliance telecom in Memory of Sh.Dhirubhai Ambani at Reliance centre Jinda village . Prof Lakhbir Singh told referring facts of WHO that 8 million units of blood are collected globally every year. Only 45% of these are donated in developing countries and transitional countries where more than 80 % of world’s population lives. 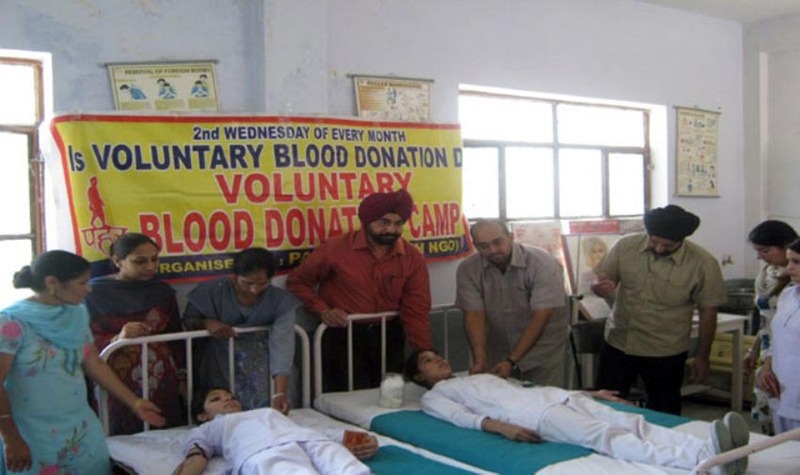 It is because of lack of education and awareness that our masses particularly youth is not donating blood in large scale to meet the need of our nation and state. In Punjab we need about 2 lacs of blood units but we are able to collect only 40% of it voluntarily and rest is being met by replacement of by other unfair means. 40 young people from various places donated blood. In this special program, Dr. Sp Singh Head Eye Association was the Chief Guest, Sh. Lalit Mohan,Sh.Sunil Sharma Commercial officer resided over the function. Miss Narinder Kaur and Miss Surinderjit Kaur conducted the whole program.